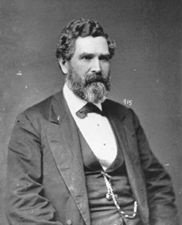 BECK, James Burnie, a Representative and a Senator from Kentucky; born in Dumfriesshire, Scotland, February 13, 1822; immigrated to the United States in 1838 and settled in Wyoming County, N.Y.; moved to Lexington, Ky., in 1843 and was graduated from Transylvania University, Lexington, Ky., in 1846; admitted to the bar and commenced the practice of law in Lexington; elected as a Democrat to the Fortieth and to the three succeeding Congresses (March 4, 1867-March 3, 1875); appointed in May 1876 a member of the commission to define the boundary line between Maryland and Virginia; elected to the United States Senate in 1876; reelected in 1882, again in 1888, and served from March 4, 1877, until his death in Washington, D.C., on May 3, 1890; Democratic Conference Chairman 1885-1890; chairman, Committee on Transportation Routes to the Seaboard (Forty-sixth Congress); interment in Lexington Cemetery, Lexington, Ky.
U.S. Congress. Memorial Addresses for James Beck. 51st Cong., 2nd sess., 1890-1891. Washington, D.C.: Government Printing Office, 1891.